I'm excited about my in-progress "Raspberries" painting. This is why I'm a little sad that I've decided to start the painting over. I do a lot of thinking about painting while I'm driving, whether it's because the scenery inspires me, or I'm working through a painting in my mind. 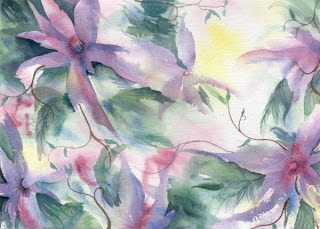 Today is was the latter, and I started thinking about my "Expressly Clematis" painting. It's still one of my proudest watercolor achievements. In fact, I used it as the focal piece in my solo show at the Dawson Creek Art Gallery in 2002, featured on the invitation. I loved the freedom I felt when I was creating "Expressly Clematis". I wasn't attempting to copy a photo, or achieve realism. I felt instead that I was plumbing my creative soul and exploring the essence of my subject, not just a flower, but a season of life, and the result is what makes me different from any other watercolor artist, what I have to offer that is unique and unavailable from anyone else. So I am going to start again with my raspberries painting. I will continue my mantra "Be Brave" but use my courage to look deeper than my reference photo, to delve again into my creative well. I have little doubt that if I continued on the painting as it stands now, it would finish beautifully. But it would also look a lot like something that any competent watercolorist could have painted, and I want my art to be about more than technique.